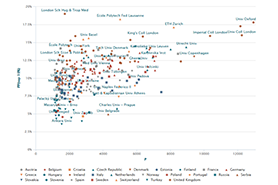 The CWTS Leiden Ranking 2018 offers important insights into the scientific performance of nearly 1000 major universities worldwide. Select your preferred indicators, generate results and explore the scientific impact and collaboration of universities. The Leiden Ranking enables you to select sophisticated bibliometric indicators, to generate results based on these indicators and to explore the results from three different perspectives. 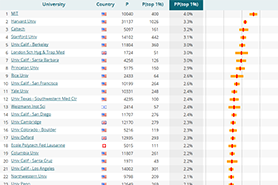 Best known is the traditional list view, in which you can rank universities according to a selected indicator. The Leiden Ranking offers two additional perspectives: the chart view and the map view. The chart view shows universities in a scatter plot, so that you can explore the performance of universities using two selected indicators. 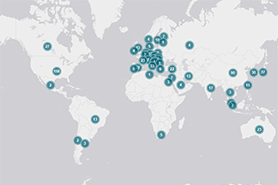 The map view shows universities in a world map and provides a geographical perspective on universities and their performance. The Leiden Ranking stands for a multidimensional perspective on university performance. To read more about why this is crucial, please see our principles for the responsible use of university rankings. The default order of universities in the list view is based on the size of a university’s publication output. It is up to you to select the output, impact or collaboration indicator that you wish to use to rank universities. Size matters when comparing universities: performance can be viewed from an absolute or a relative perspective (the number versus the percentage of highly cited publications). That is why size-dependent and size-independent indicators are consistently presented together in the Leiden Ranking. This highlights that both types of indicators need to be taken into account. Compared with other university rankings, the Leiden Ranking offers more advanced indicators of scientific impact and collaboration. The underlying bibliometric methodology is richly documented. The Leiden Ranking provides information exclusively about the research done at universities. Research is represented in publications, and carefully collected data about these publications forms the basis for the Leiden Ranking. This basis also ensures the independence of the Leiden Ranking, since it does not rely on data submitted by the universities themselves. Finally, because universities are complex institutions that have a variety of forms, contexts and missions, their performance cannot be represented by a single number. The Leiden Ranking consistently presents different indicators for you to explore the performance of universities from different angles. The CWTS Leiden Ranking 2019 will be released on May 15, 2019. CWTS has developed ten principles for responsible use of university rankings. We present these principles in a blog post and in an animation. June 20, 2018. After the release of the CWTS Leiden Ranking 2018 last May, we now invite you to look again at the ranking. A step-by-step tour has been added to the list, chart, and map views to assist you in the use of the website. June 14, 2018. Some corrections have been made to the CWTS Leiden Ranking 2018. These corrections pertain to the University of the Chinese Academy of Sciences and to a few French universities. More information is available here.